Polymer expert igus has launched a new interactive blog (blog.igus.co.uk) to keep its community of engineers and designers updated with its latest innovations and initiatives; from the 85 iglidur bearings that bring RoboThespian to life, to the latest video of the week about igubal's multiple applications. 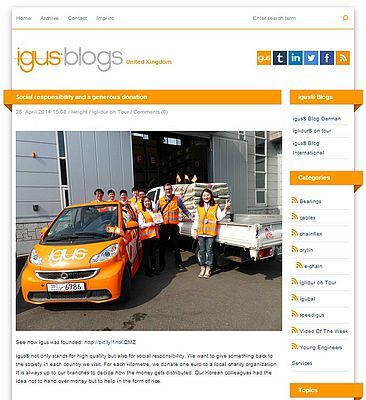 Amongst the new features of igus' blog is the iglidur on tour's photo diary, which follows the wonderings of iglidur's small orange car, from its remodelling to its tour around the world. Fully equipped with igus bearings to celebrate iglidur's 30th anniversary, the car has finished its Indian tour and is now ready for new adventures across fields, mountains and forests, from China to the USA and Brazil - to mention but a few. With also regular product updates and application stories, the blog also gives designers and engineers a unique opportunity to interact with igus' community, by reading exclusive product manager interviews, watching photos and video clips and posting comments. For example, the blog provides useful advice on how to obtain extensive information on flexible cables by simply accessing the latest igus technical data sheets.